Are you leading authentically? Are you living from your values and with a sense of purpose? What would that look like? 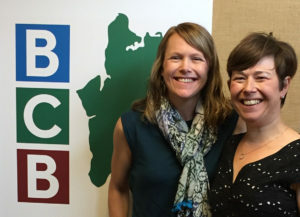 In this podcast, BCB host Christina Hulet explores these questions with Brooke Rufo-Hill and Penny Koch-Patterson, organizers of an upcoming two-day retreat on Authentic Leadership for Women. Brooke and Penny talk about their own journey as women leaders, and their efforts to create a retreat that speaks to our highest callings. The retreat will bring together a dynamic group of courageous and curious women looking to transform the way they live, work, and lead. It is designed to be highly personalized, experiential, and interactive. The retreat will draw on many contemporary resources and thought leaders, including the work of Tara Mohr and Amy Cuddy. It will also provide various leadership assessment and visioning tools, and include personalized coaching sessions. The Authentic Leadership for Women retreat will be on Thursday and Friday, October 6th and 7th at IslandWood. Space is still available! For more information, please visit: www.authenticleadershipforwomen.com. Bainbridge Community Broadcast listeners can take advantage of a $200 retreat discount (use discount code: BCB).